What does “green house cleaning” mean? It means that you can be confident about the environment you and your family are living in. It means you can feel better knowing you’re not flushing harmful chemicals into the environment. It means that you’re aware of the current condition of our planet and that you want to do your part to make individual life decisions like opting for green cleaning solutions for a better future. Clean Arrival LLC is a proud Portland green house cleaning company. Owned by a local Portland gal, we know how seriously we take our mountains, rivers, lakes and air. When you choose to work with us and our green cleaning options, you’re choosing to care both about the environment inside your home, and outside of it too. If you really want to understand how flushing harmful chemicals directly into our waterways can directly affect you and your family or friends then let’s analyze the Willamette River. The Willamette is without a doubt one of the most popular and well known waterways in the Pacific Northwest. This is particularly true in Portland which is where we became famous for our many modern bridges transcending this enormous waterway. The Willamette River flows northward between the Oregon Coast Range and the Cascade Range, the river and its tributaries form in the Willamette Valley, which is a basin that contains two-thirds of Oregon’s population, including the state capital, Salem, and the state’s largest city, Portland, which surrounds the Willamette’s mouth at the Columbia. So as you can see, it’s probably a good idea for us to stop polluting our waters. Just because we use green cleaning ingredients doesn’t mean your home can’t be just as clean as the conventional chemicals that can literally burn your skin off. You would be surprised how far a few common household ingredients can go. We guarantee your home will be fresh and sparkling clean when you arrive, the main difference with the natural ingredients is that we may just have to work a little harder to get those stains out. White vinegar: From showerheads to soapy heads, copper to microwaves, vinegar is a versatile, environmentally-safe alternative to store-bought cleaner and it’s cheap too! Liquid castile soap: From floors to ceilings, liquid Castile soap can be used to clean almost anything and everything in between! Plus, because it’s eco-friendly and gentle on your skin, you don’t have to worry about harming your health or that of the planet. Natural salt: Salt works as an effective yet gentle scouring agent and can also serve as a catalyst for other ingredients, such as vinegar, to boosting the cleaning and deodorizing action. For a basic soft scrub, make a paste with lots of salt, baking soda, and dish soap and use on appliances, enamel, porcelain, etc. 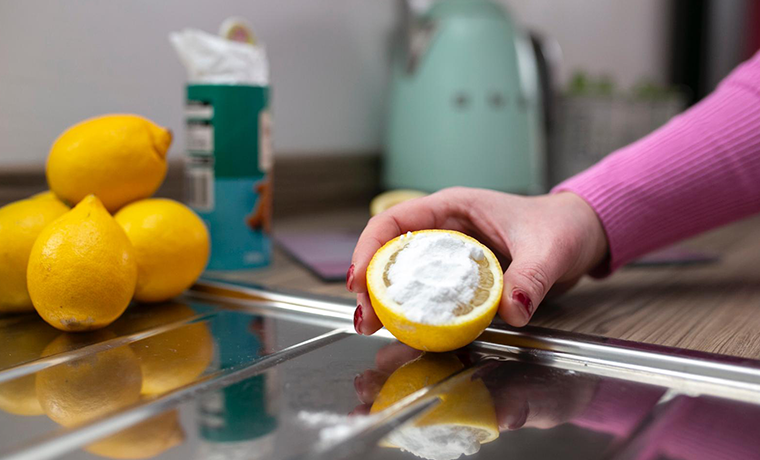 Baking soda: A warm paste of baking soda can make removing stains and food particles a breeze. Just let it soak in for a few minutes then scrub or wipe it away. Washing soda: Washing soda can help make some of your toughest cleaning tasks easier. For instance, you can use a solution of 1/2 cup of washing soda dissolved in 1 gallon of warm water to clean your oven, range, and broiler pans! Hydrogen peroxide: Hydrogen peroxide is also good for cleaning walls, glass, doorknobs, countertops, sinks, and other hard surfaces. It’s recommended to use the three percent solution undiluted in a spray bottle and spray it on the surface to be cleaned. Lemons: Lemons are high in citric acid, lemon juice is one of the best natural cleaners due to its low pH and antibacterial properties. Plus they make the house smell great too! Essential oils: If you want to have a lovely aroma left over without using unwanted chemicals then you should consider essential oils. Our green cleaning service areas include Portland, Milwaukie, Beaverton, Hillsboro, Lake Oswego, Oregon City, Tigard, King City, Troutdale, West Linn, and Gresham. Contact us anytime for a cleaning and we will be happy to help! For the best local green house cleaning solutions contact Clean Arrival LLC. To schedule a cleaning service visit our booking page or call us at 503-567-5404. You can also message us on Facebook or email us here.